Now we have been connecting to the federation member and the next step is to create the federated tables. 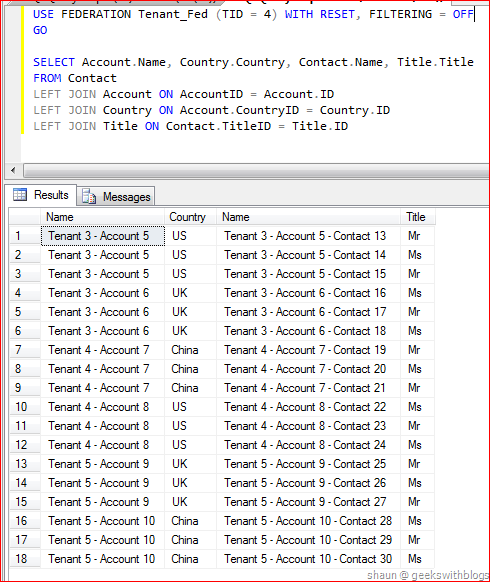 Based on our design the Account and Contact table should be partitioning by their TenantID column so let’s create them by the following T-SQL. And similarly, in Contact table we also need to add the TenantID column as the primary key. We also need to amend the foreign keys as well. The T-SQL should be like this. 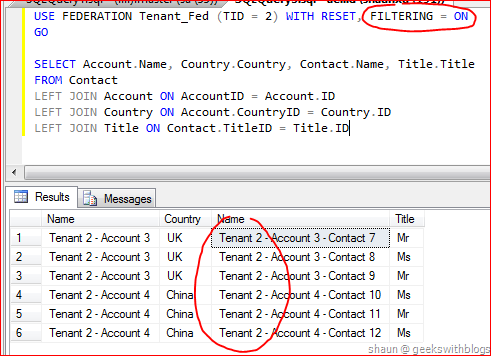 There is no constraint that the federation column name should be the same in each federated tables. We can specify the federation key to the different columns that has different names in each federated tables when created the tables. 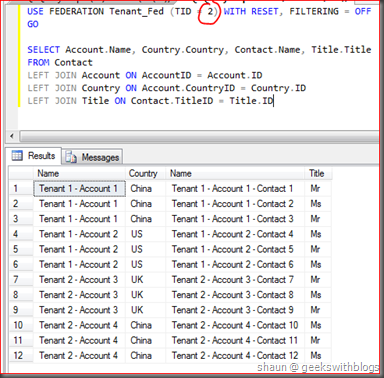 For example in Account table we link TID = TenantID while in Contact table we link TID = Tenant_ID or TID = T_ID, etc..
And in the T-SQL above we also added the foreign keys between the reference tables and federated tables. 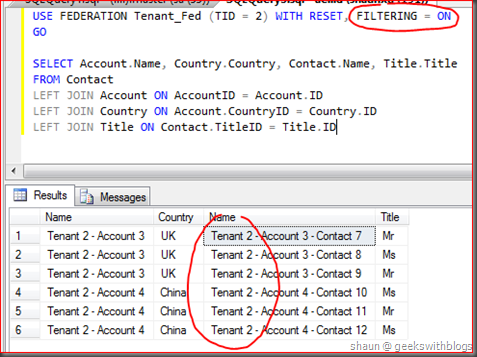 It’s possible to add the foreign keys between the federated tables, like what we added between the Account and Contact. 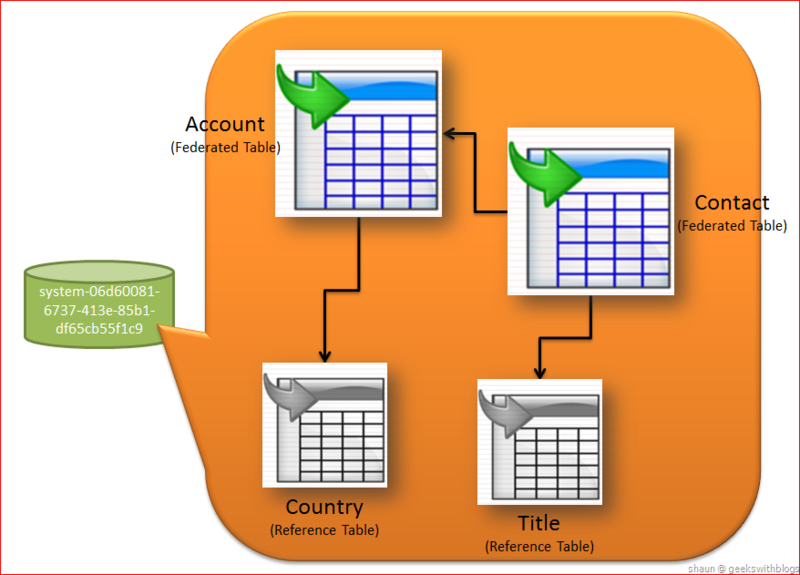 It’s possible to add the foreign key from the federated table to reference table, like the key between Account and Country. But it’s not allowed to add the foreign key from a non-federated table to a federated table. 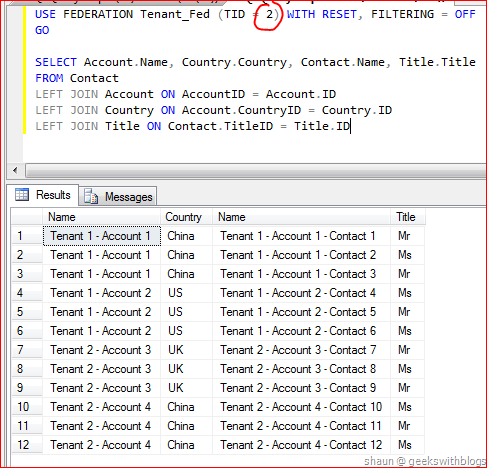 For example we cannot add a foreign key between the Account to a table in the federation root. After executed these T-SQL we had put all data in our first federation member. It contains two references tables (Country, Title) and two federated tables (Account, Contact), and some foreign keys between the reference table and federated table. 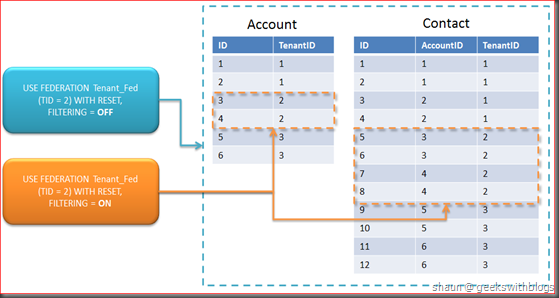 SQL Azure Federation is a very powerful tool for us to build scale-out and/or multi-tenant application. In the coming few posts I would like to discuss the metadata system of the federation, the pricing and how to split the federation members based on the data size or record count. As many of you may already know that, I'm working at a global gaming and entertainment company taking the responsible for design and implement the next generation platform which will be running on the cloud, and also design the cloud platform as well. Currently one of the goal is to replace the active directory integrated security and identity solution with certificate-based solution in our product. 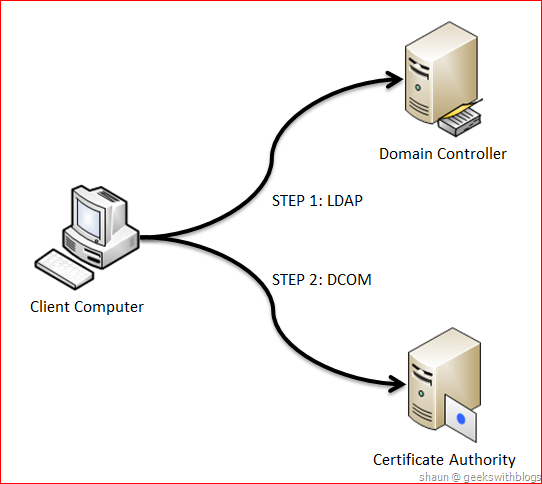 In short, we need to work with Active Directory Certificate Service to request and issue the certificates for vary clients, so that they can use these certificates to connect our services from any devices, such as PC, smart phone, and pad, etc., securely. Since what we need to implement first is a certificate service that can be used by any clients. This service will be talking to the Windows Active Directory Certificate Service (AD CS) through C#. There are many articles for IT Pro on how to install and configure the AD CS, but very few on how to communicate with AD CS by C#. 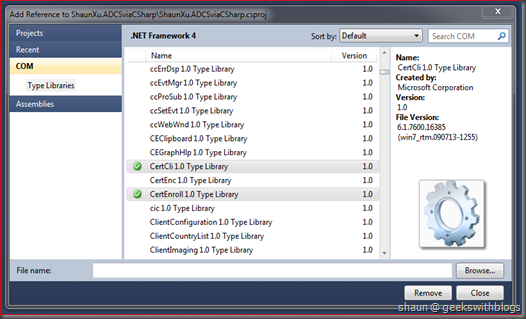 In this post I will describe and demonstrate how to work with the AD CS via C#. So I will not talk much about the theory of digital certificate, public key infrastructure and certificate authority, but will focus on how to use them. Certificate, also known as public key certificate or digital certificate, is an electronic document which uses a digital signature to bind a public key with an identity. The identity could be anything. For example it could be represent a user, a device, a service or even a few lines of code. The certificate can be used to sign the identity and could be verified by others. For example a message being signed by a certificate could be verified by the receiver, so that it will be able to know whether the message is the original one or had been modified by someone else. The certificate can also be used to encrypt and decrypt. This is the reason why we can bind a certificate on a website so that the data between the browser and server would be secured, since they are been encrypted and signed by the certificate. 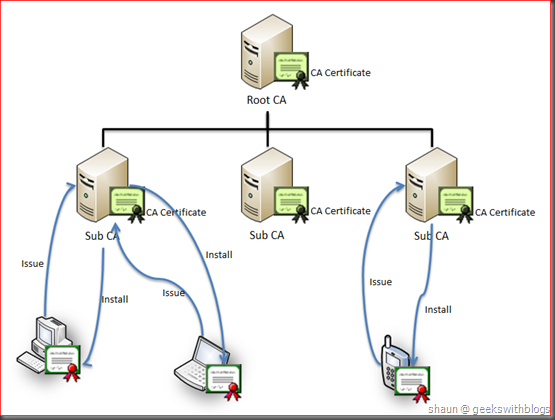 The certificate authority (CA) takes the responsible to issue the certificates. In Unix people can use OpenSSL's ca command or SuSE's gensslcert to issue certificate. 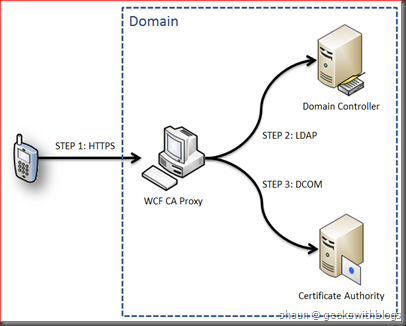 In Windows we can use the Active Directory Certificate Service. In an enterprise there might be more than one CAs and normally they will be organized hierarchically. 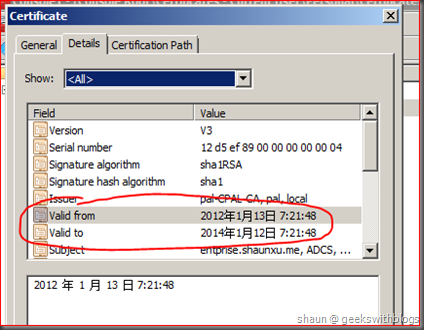 The top level would be the Root CA, which have a certificate signed by itself. All subordinate CAs’ certificate should be requested to and signed by the root CA. Each CA can receive the certificate request from the client and issue them. 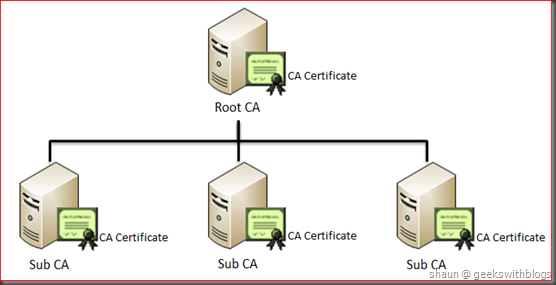 Normally, the root CA would not be reachable by the clients since it holds the root CA certificate which is very important. 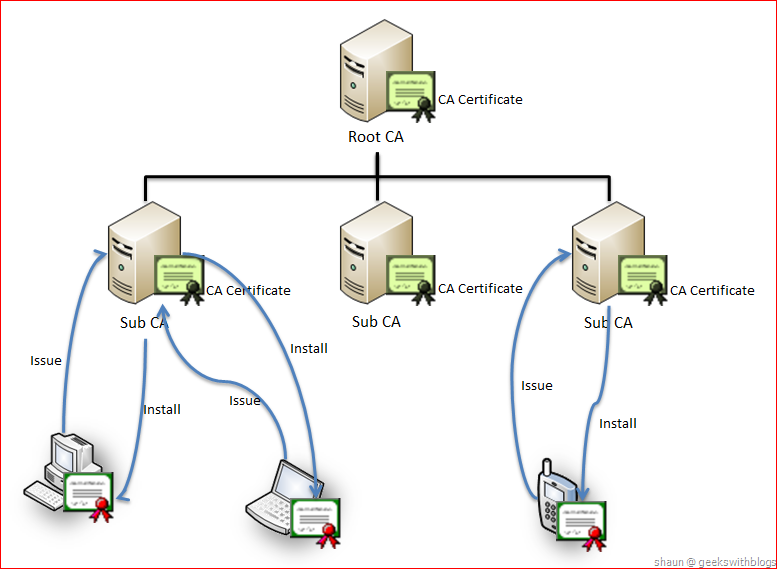 Clients may send the certificate request to some subordinate CAs and get the certificate installed. 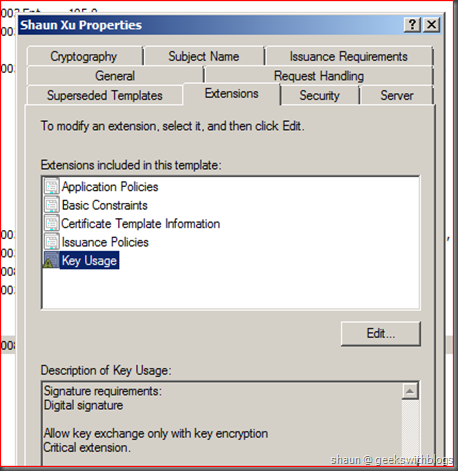 The certificate contains a key pair, which includes a private key and a public key. In order to make the private key secured, when requesting and installing the certificate, the private key should never be passed out of the client. 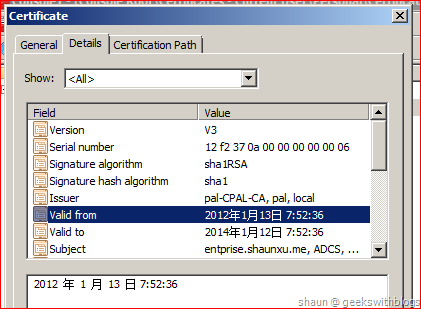 Certificate request could be in PKCS #10 or CMC format, sent from the client to the CA. The subordinate CA received the request, and based on the request handling and policies, it will mark the request as pending status and let the administrator issue or deny manually, or automatically issue them. 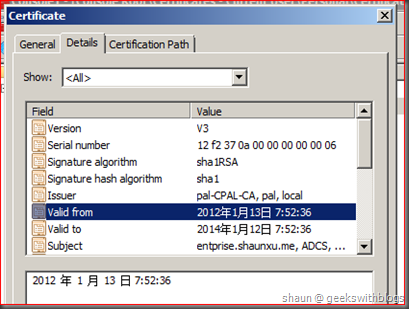 The certificate response would be in PKCS #7 format, signed by the CA certificate. Then the client will verify the response and combine it with the original private key to a full certificate. Generate the key pair and some other stuff in order to send to the CA. 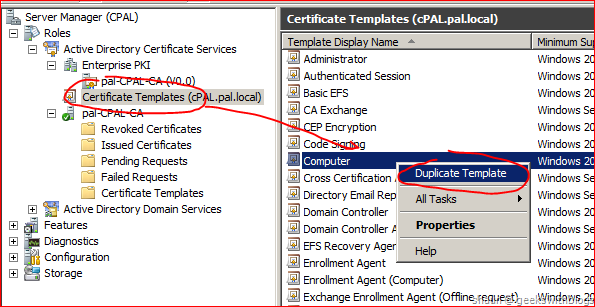 Generate the certificate request in PKCS #10 or CMC format, and submit to CA. 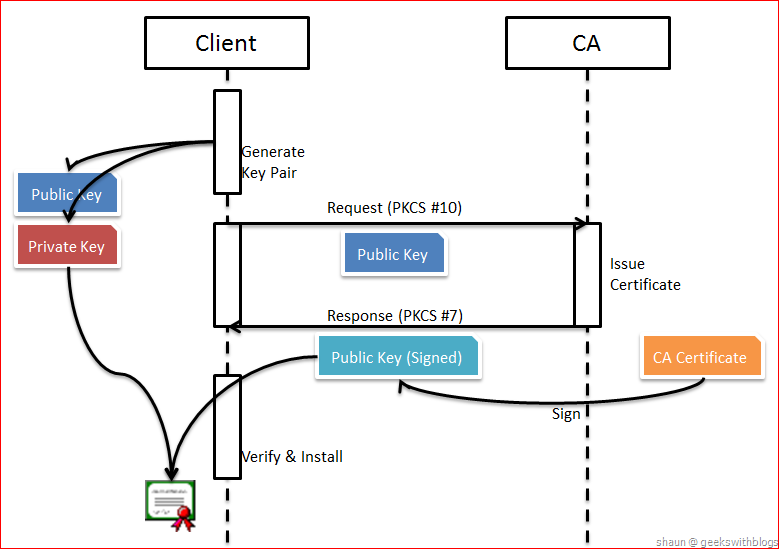 Combine and install the full certificate on client based on the local key pair and the CA response. 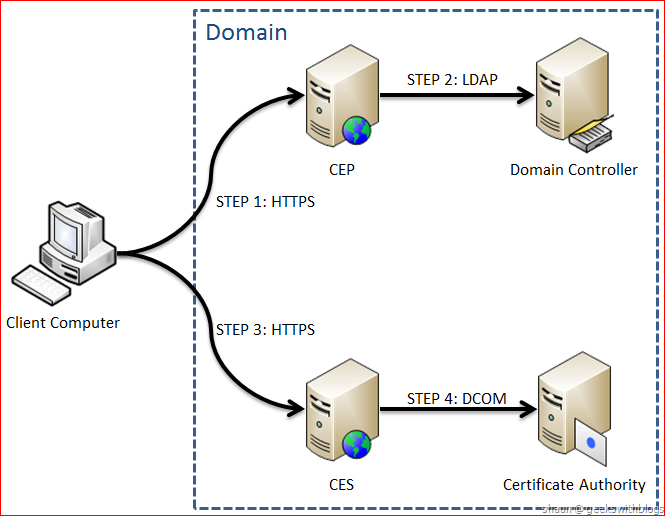 In Windows Server 2008 R2, the AD CS introduced a new component named CES and CEP, which are Certificate Enrollment Service and Certificate Enrollment Policy. The client can communicate with CA through these web services. But in the prior version we have to use two COM: CertCli and CertEnroll. CertCli component takes the responsible for connecting the CA server to submit the certificate request, certificate renew request and look for the request ID that CA server has. When connect from other machine the CertCli utilizes DCOM technology to invoke the CA functionality. This means, the CertCli cannot be used out of the domain or between the firewall. CertEnroll component takes the responsible for generate the PKCS message, install and export the certificate. It doesn’t need to communicate to the CA directly. Since in .NET we can wrap the COM and use it in managed code, we should be able to communicate with the CA by using them. There are two types of CA: enterprise CA and standalone CA. There are many differences between them. But to be simplified, the standalone CA cannot use the certificate template. In this post I will firstly demonstrate how to request the certificate to a standalone CA. It’s only two steps to request a certificate, first one is to generate the request message, and then send the message to CA. To generate a valid certificate request message we need to use the CertEnroll COM, to send the request to need to use the CertCli COM. So let’s create a new console application and added these 2 COM components into the references. To make sure the code runs successfully, it’s recommended to execute the sample code on the CA server, or at least the server on the same domain with the CA server. I will explain more about this later. There are many information we need to specify or provide in order to build the request message. 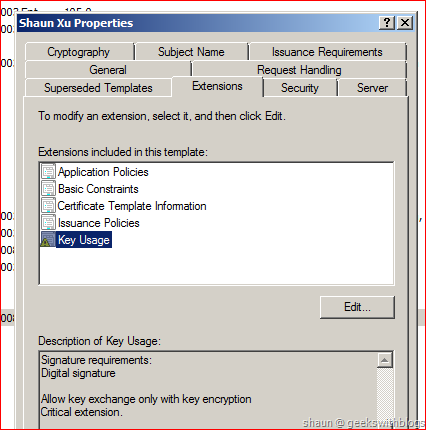 The first one is to select the valid cryptographic service provider (CSP). There are many CSPs built in the Windows. We can choose one of them, or we can just let the operation system retrieve all valid CSPs to us to use. Length: The key length of the private key. Normally the key length should NOT less than 1024 for security consideration. Key Spec: Define how this key pair, and the certificate will be used. For example digital signature or key exchange. Key Usage: The key usage value will be upgrade based on the Key Spec we defined. Machine Context: Specify whether the certificate will be used for current user and machine. Export Policy: Specify whether the private key can be exported or not from this machine. CSP Information: The valid CSPs for this key pair. When we finished to define all information listed above we can just invoke CX509PrivateKey.Create to let the operation system generate a key pair for us. It will be stored in the machine in a “magic” folder. Next step, initialize the PKCS #10 object from the private we had just created. We need to specify whether the certificate should be used for current user or machine, which must be as same as the value of Machine Context that we defined in previous step. Since we will send the request to a standalone CA we will not specify the template here. Next, specify some extension information to the certificate. I will not deep into these extensions. Just one thing, all extensions in certificate will be defined by an identity named Object ID (OID). So if we want to add some extensions to the certificate we need to specify the OID rather than the name. For example, in the code below I added “Client Authentication” enhanced key usage extension to the certificate by specifying its OID “1.3.6.1.5.5.7.3.2”. We can define one or more fields when request the certificate and it will combine in the format like this. For example this is a valid subject with the CN, C, S, L, O and OU defined. To specify the subject in C# we also need to provide them into the same format, and set into the PKCS #10 object. Finally we initialize the CertEnroll COM object by passing the PKCS #10 in and invoke its CreateRequest method to generate the certificate request in base64 format. So the full code for certificate request generation would be like this. Send the certificate request message we had just generated to a CA would be easy. In fact we can save the message into a text file and copy to the CA server, request the certificate by using the CA manage portal. But if we are going to use C# then we will need to use CertCli COM to send the message, and verify the status by retrieving the disposition status and request ID. 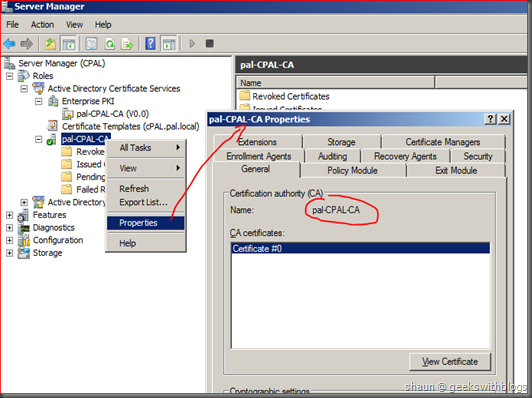 The CA name can be found by logging on the CA server and navigate to the Active Directory Certificate Service node in Server Manager window. Right click the CA node and select Properties. The code would be like this. The return value of the Submit method indicates the status of the certificate request, normally it would be in the statuses below. 0x03: Issued. This means the certificate had been issued by the CA that we can download and install to the local machine. 0x05: Under submission. This means the request was in pending status, the certificate administrator need to issue it manually. Failed due to some reason. We can use CCertRequest.GetDispositionMessage method to retrieve the failure reason. Then go to the Issued Certificates node we can see the issued certificate available. The certificate couldn’t be downloaded and installed into the machine where it requested unless in this status. Back to the source to implement the code to download and install the full certificate. First of all, we will utilize the CCertRequest.RetrievePending method to detect the status of our certificate request had sent. If it’s issued then we will download the response, which is in PKCS #7 format, to the local machine by using the method CCertRequest.GetCertificate. Then initialize the CertEnroll object from context user certificate store, install the response that we had just retrieved. After it downloaded and installed the certificate we can check it’s in the current user certificate store. And from now on, since the certificate was in the store, we can use X509Store and X509Certificate2 class to export and view the attributes such as subject, thumbprint, etc.. In the section above we discussed on how to use C# to communicate with AD CS, that is a standalone CA. A standalone CA has some limitation comparing with the enterprise CA. The biggest difference is that, the standalone CA cannot use the certificate templates. When we implement the certificate request function, we specified everything the certificate needs. And for a CA there’s no way to define what kind of information can be set by request, what policy should the request follow. And there’s no way to define how long the certificate will be valid, which is the validity period, as well. All certificates issued by a standalone CA will have the same validity period, which is defined at the register in CA server. But if we are using enterprise CA, we can define vary rules and validity period in each template. The enterprise templates are stored in the active directory, which means all CAs in the AD can select which templates they can use. This is a good way to control the certificate issuing permission. You can verify if a CA is enterprise or not by opening the CA portal. If there’s a sub folder named Certificate Templates it means this is an enterprise CA. Let’s create a template and specify some rules. Click the Certificate Templates node which under the Active Directory Certificate Service node and select a template named Computer. Right click the template and click Duplicate Template. You can not create a brand new template. Instead you have to duplicate an existing template. Select Windows Server 2008 Enterprise version on the popping up windows and specify a template name. In the template properties window we can see that it’s possible to define the validity period of it. All certificates that requested and issued on this template will have the same validity period. And there are many items we can define as well. 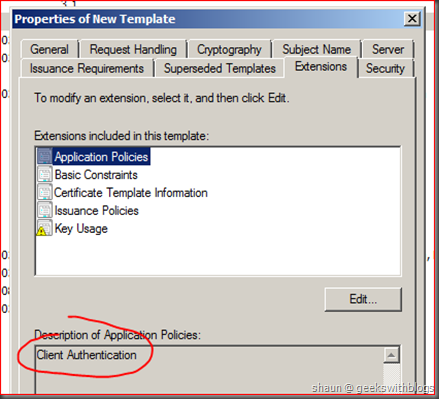 For example we can have the “Client Authenticate” in the application policies extension, which we had specified in code in previous sample. And we can define what kind of value can be set to the subject in certificates. This provides a good way for certificate administrator to control the value of the certificates. 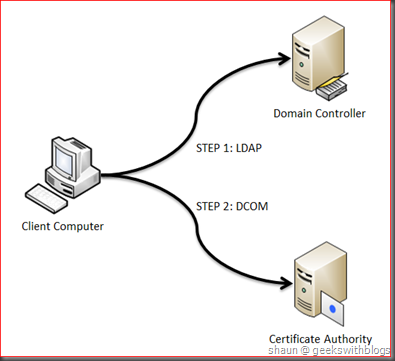 For example, if the certificate is to represent a domain user, the subject must be a valid AD user. But in this case we will let the request supply the subject which means no control on CA side. Once we created the template we also need to issue this template to this CA server, which means it can be received and issued by this CA. 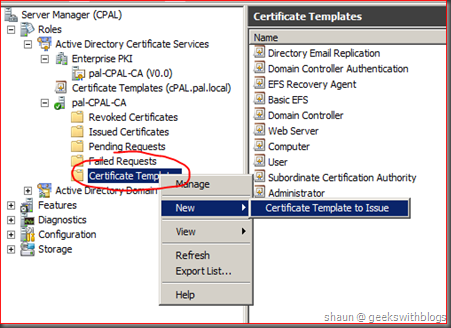 Right click the Certificate Templates node and select New > Certificate Template to Issue, and select the template we have just created. Now the template is ready for use. 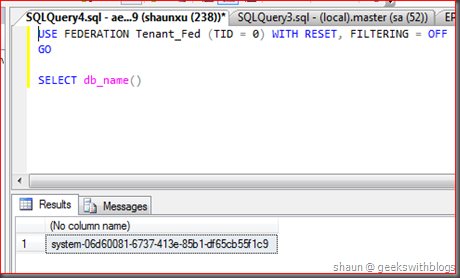 Then we will change our code to send request to enterprise CA with template specified. Send the certificate request to an enterprise CA would be very similar as what we did on a standalone CA. Previously when we generated the key pair we used an empty string on the template name parameter. So now for enterprise CA we will specify which template we are going to use. It’s not allowed to request a certificate without template specified on an enterprise CA. This means we have to set a template. On the other hand, standalone CA does not allow the request related with a template. Seems that we finished, but if we just execute it will throw an exception to us, said that the file exists when adding some extensions. The exception message could be a little bit confusing. In fact this is because we defined something which had been defined in the certificate template. If we dig into the source code we can see that the exception occurred when we added the key usage extension. And if we get back to the CA server and open the template we are using, we can find that the key usage had been defined in the template. This means in the code, or in the certificate request we should not specify it again. Hence we need to comment the code for adding the key usage, also we need to comment the enhanced key usage part since it had been defined in the template, too. Because we let the request supply the subject name so here we can still specify the subject information in the request. The method for generating request message would be like this. It works well this time and installed the certificate successfully. If we open the certificate store in MMC we can see the new one with the template displayed. A certificate must have a limited validity period. For example the certificate we had just request before is valid through 2012-01-13 07:21:48 to 20124-01-12 07:21:48. 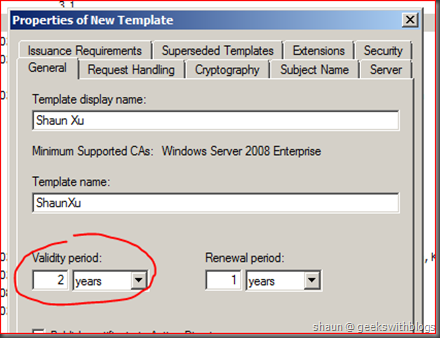 When the certificate is going to be expired the operation system will send the renew request to the CA server automatically to attempt renew it. But we can ask to renew it by our code. To send a certificate renewal message we must have this certificate installed in the certificate store. It could be in local machine or current user store. The first step is to find it by using the X509Store.Certificates.Find. 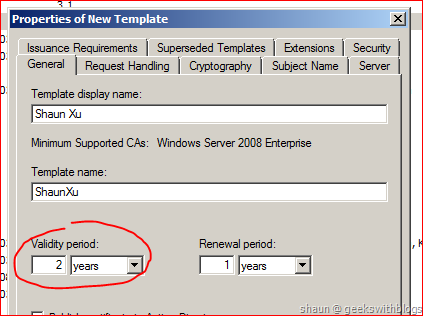 The certificate renew request is in PKCS #7 format. So in the next step, we will create an object of PKCS #7 and initialize it from the certificate we had just found from the certificate store. When initializing we’d specify that this is a renew request in the parameter. We also need to specify that the new certificate will inherit the validity period and the key pair from the existing one. Then the following code would be very similar with what we did to send the new request before. Using the CertEnroll to generate the request message and send it out by CertCli, and check the disposition status. When the request had been sent to the CA, based on the request handling policy it will be issued automatically or manually by the administrator. To download and install the renewed certificate would be the same like what we did before, so just use the method that download the new certificate should be fine. The full code would be like this. Just note that I hard-coded my certificate thumbprint in the code. After executed and back to the certificate store we can see the certificate renewed by the CA, which its validity period had been changed from 2012-01-13 07:21:48 - 20124-01-12 7:21:48 to 2012-01-13 07:52:36 - 20124-01-12 07:52:36. The old certificate had been archived by the operation system automatically. As I mentioned before, the sample code in this post should be executed in the same server of CA, or at least a server in the CA’s domain. This is the limitation when using CertCli and CertEnroll to communication with CA. First of all, CA integrated with active directory. By default, only the authenticated user can request certificate. Secondly, if we are using enterprise CA, all templates are being stored in the AD. 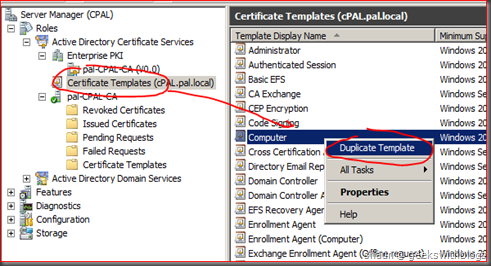 When the client request a new certificate with template specified, it will try to retrieve the template information from AD. So before Windows Server 2008 R2 it would be very difficult to communicate to the CA from the client that out of the domain. 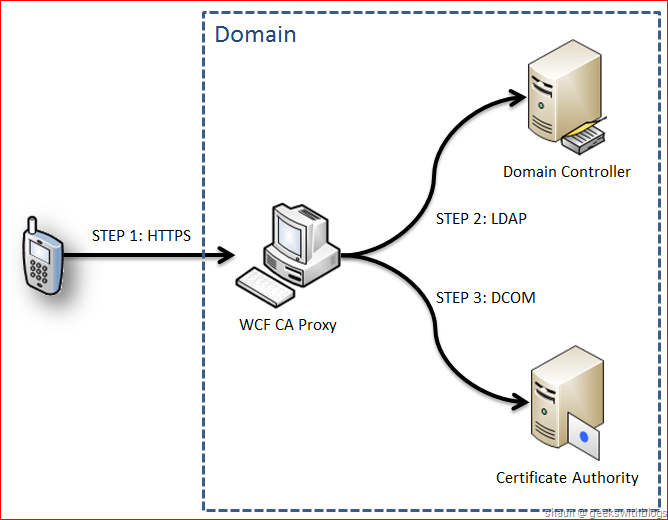 This is why, in the beginning of this post I mentioned, that I’m working on a WCF web service working as a proxy to let the client (PC, laptop and mobile) connect and request certificates out side from the domain. But if we have the Windows Server 2008 R2, it introduced a new component of AD CS which called Certificate Enrollment Web Services. Basically it includes two web services that wraps the LDAP invoke and DCOM invoke, so that the client can communicate with them through HTTPS with WS-Trust. When I was beginning to work on this task I found there is very little information on the internet about how to communicate with the CA by C#, or even by code. I think this is because, CA is something related with IT Pro that more focused on how to install and configure. IT Pro doesn’t care about the code. Communicating from C# is more related with development but developer doesn’t care about the CA since it’s something about IT infrastructure. So this topic is in the middle of the two worlds - IT and development. But I think when we move to the cloud computing, the enterprise application, most of them we need to migration the existing AD integrated architecture to certificate-based architecture, which need to replace the existing security, authentication, identification parts. In this post I introduced a little bit background knowledge about CA, especially the AD CS. 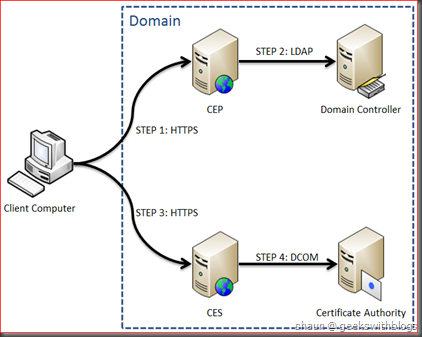 I demonstrated how to request, install and renew a certificate to a standalone and an enterprise CA by C# through COM. I also mentioned a little bit about the new Certificate Enrollment Web Service. Thanks to the great post and articles I referred recently, this and this. There are still some topics I didn’t cover. For example the online revocation list, SCEP, OCSP, etc.. We need them if we need to build a fully, robust, online certificate solution. The SQL Azure Federation had been publically launched several weeks ago and this is one of the most existing features I’m looking forward. This might be the first post of SQL Azure Federation, and hopefully not the last one. SQL Azure Federation was mentioned in about 2009. The Microsoft told that there will be a feature in SQL Azure allow users to split one database into many based on some sort of rules But from the client side perspective, user can interact their data as if in one database. This feature was called SQL Azure Federation. At the TechED China 2010, when I talked with Zach, a technical evangelist at Microsoft focus on Windows Azure platform when the SQL Azure Federation would be available, or even though CTP for MVPs or partners. But at that moment Zach said he still don’t have a chance to take a look at it. I remembered it was Dec, 2010. But the good news came on June 2011, Microsoft had opened the nomination of the PE Program of SQL Azure Federation. And I was very lucky being approved to use this feature and provide some early feedback to Microsoft. During the PE program I had attended several online meetings and have the chance to play with it in some of my projects. Cihan Biyikoglu, the program manager in SQL Azure team and his group gave me a lot of information and suggestion on how the SQL Azure Federation works and how to use it in the best approach. During the PE program, the Microsoft said that SQL Azure Federation will be available at the end of 2011. In 12th, Dec 2011 the SQL Azure Federation was launched with the SQL Azure Q4 2011 Service Release, with some other cool features, which you can have a reference here. Federation is not a new concept or technology in computer science. But it could be meaning differently in different context, such as WS-Federation, Active Directory Federation Services, etc. 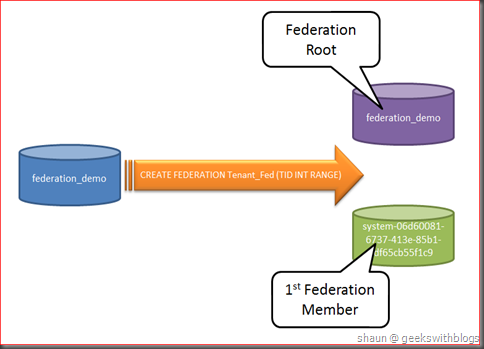 But in this, and the following blog posts about SQL Azure Federation, the word “Federation” I mentioned would be focus on the Data Federation. Federation, as known as the data shard or partitioning, is a database design principle whereby rows of a database table are held separately. It also be known as horizontal partitioning. 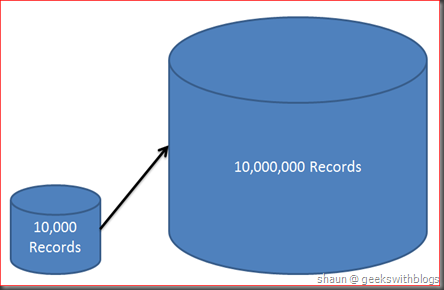 Assuming that we have a database and a table named Product which contains the product records, and now there’s 10,000 records there. After a while the number of the records raised to 10,000,000. If they are all in the same database it might cause performance problem. In this case, there are two solutions we can choose. One is to increase the hardware of the database server. For example, more CPU cores, more memory and higher network bandwidth. This approach we called Scale Up. But there will be a limitation in this way, we can not add cores, memory and much as we want. Another one is to split the database across to multiple databases and servers. 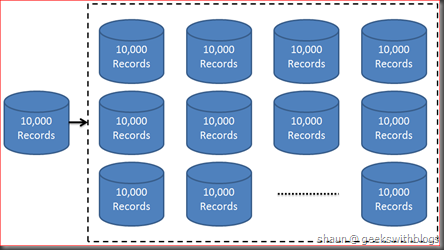 Let say we divide the database and Product table in 10 databases (servers), so in each database there will be only 1,000,000 records in Product table. We split the data volume across the multiple servers, as well as split the network load, CPU and memory usage. Furthermore, since we can have as many servers as we need, there will be no limitation to extend our system in this approach. This is called Scale Out. SQL Azure Federation implemented this approach, which helps us to split one database into many that we called federation members, to increase the performance. Let’s deep into the tables in the databases to be federated. 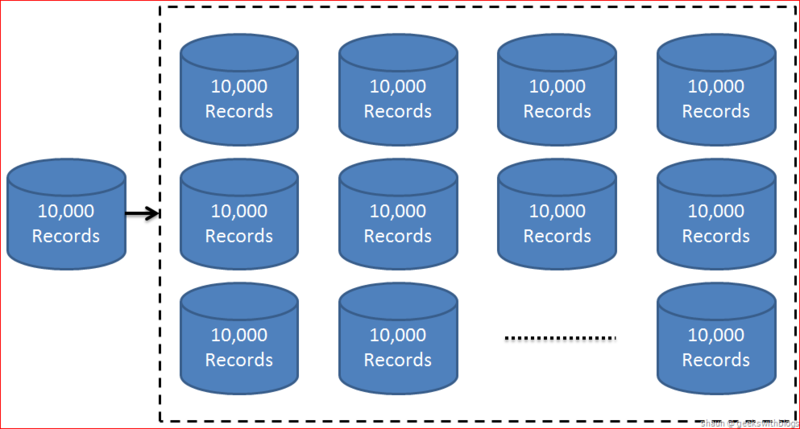 If a table was too big that introduced some performance issues, like the Product table I mentioned previously which has 10,000,000 records, we need to split them across to the databases. There are also two approaches we have, the horizontal partitioning and vertical partitioning. Have the exactly same schema. One database command on a table would be the same on any other tables. Each record represent the full information. Can retrieve all information within one query. Need to touch all databases (partitioned tables) and aggressive process when fan-out query, like SUM, AVG, COUNT, etc..
Each table would be in different schema. Query on each tables would be different. And may introduce some data redundant. Each record in a table just represent partial information. Easy to implement COD (Cost Oriented Design) by moving the columns in cheaper storage. For example moving the binary columns into Windows Azure Blob Storage. Need multiple queries when retrieve some information. Fan-out query normally can be finished within one query. 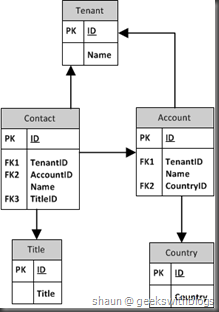 SQL Azure Federation utilize the horizontal partitioning to split the tables in multiple databases. But it’s not that simple as I mentioned above. When using horizontal partitioning, we need to firstly define the rule on how to divide the tables. In the picture above, it indicates that the table will be divided by ID, all records that ID less than 4 would into one database, and others (larger than 3) will be in another. But if we have some tables related, for example UserOrder table which have UserID as well, we need to split that table by the same rule, to make sure that all records in the tables that referred to the same UserID must be in the same partition. This will make the JOIN query quick and easy. There are also some tables that doesn’t related with the ID in this example, for instance the countries, cities, etc.. 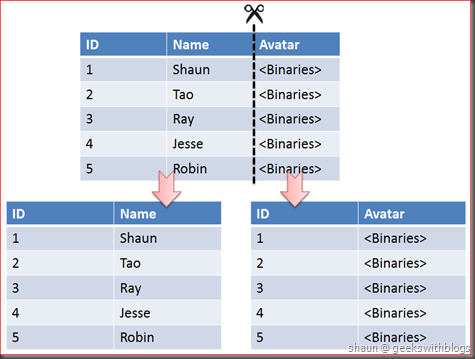 When we partitioning the database, these tables should not be split and need to be copied to each databases. The last thing is that, there might be some tables that represent the global information, like the system settings, metadata and schema data. They should not be split and should not be copied into the databases. So they will be remained in the original database we can call it root database. Now we have a fully implementation on the horizontal partitioning. We have the rule on how the data should be split. We ensure that all related records will be stored in the same database node and the lookup tables will copied across them. We also have the root database with tables that have the global information stored. I can tell you that this is what SQL Azure Federation does for us, automatically and safely. 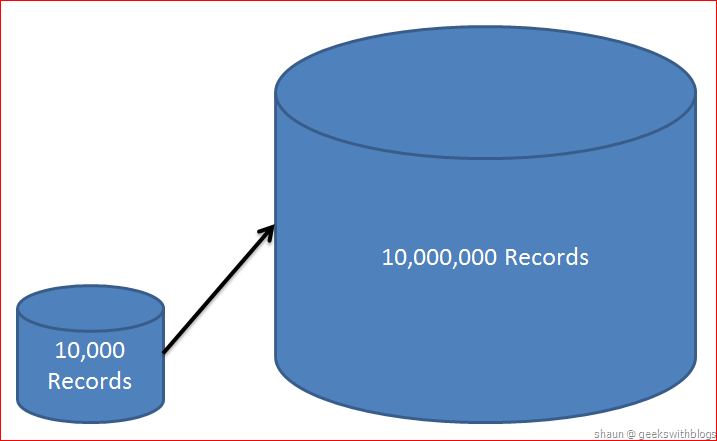 SQL Azure Federation introduces some new concepts around the data partitioning. They are federation, federation distribution, federation member, root database, federation column, federated table, reference table, center table and atomic unit. Federation is the rule on how to partition our data. There can be more than one federations in one system. But on a particular table there has to be only one federation apply. 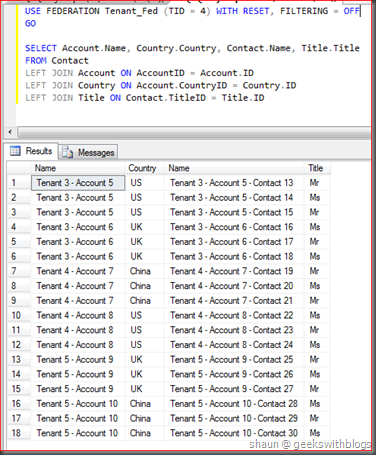 This means, for example we have a table with columns UserID and ProductID. We can apply a federation that split the table by UserID, or by ProductID, but we cannot apply both of them on the same time. Federation Name: The name of the federation which can be used when alter or connect. Federation Distribution Name: The identity name that to split the tables in this federation. For example if we want to split the tables based on the UserID then we can name the federation distribution name as “userId”, “uid” or whatever. Federation Distribution Data Type: The data type that the federation distribution name is. Currently the SQL Azure Federation only support int, bigint, uniqueidentifier and varbinary(n). 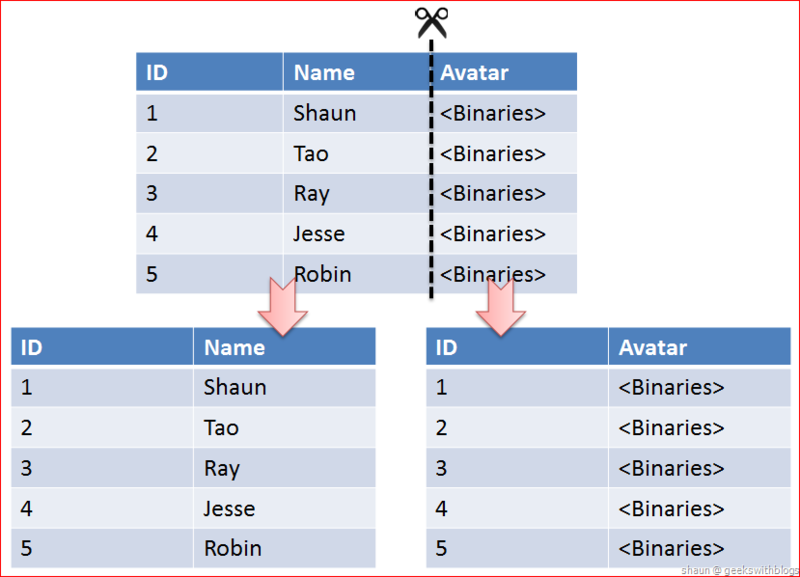 Distribution Type: How SQL Azure Federation will split the data. There are many ways to split the data such as mod, consistent hashing but currently SQL Azure Federation only support “range”. 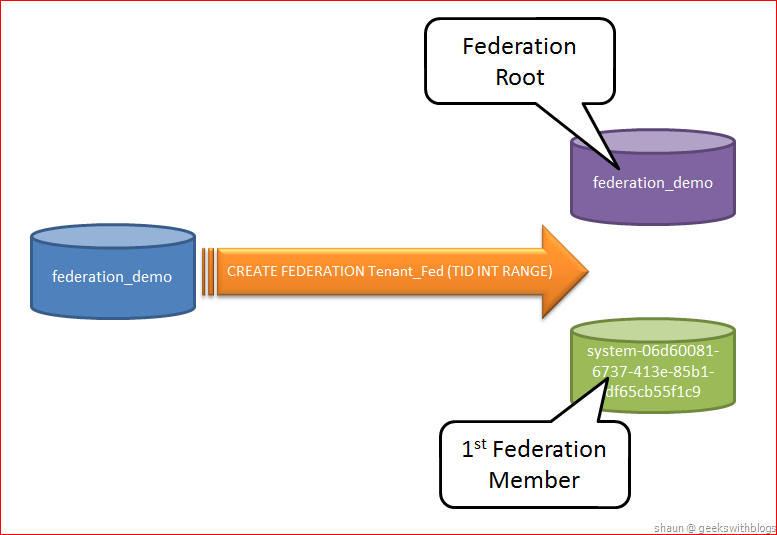 After we split database into many, based on the federation we specified, the small databases called Federation Member. 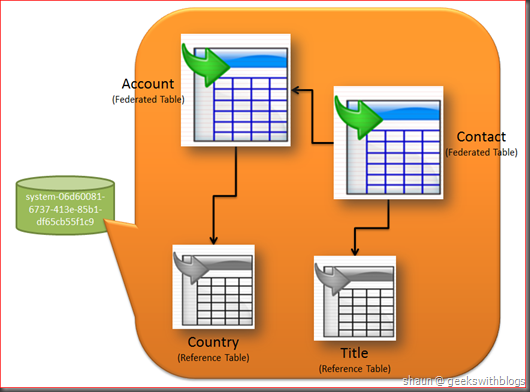 The original database, may contains some metadata tables would be called Root Database or Federation Root. The tables that is being split into the federation members are Federated Table. The tables that represent the lookup data can be copied to each federation members automatically by SQL Azure Federation, which is called Reference Table. The remaining tables in the federation root would be Center Tables. As we discussed below, when horizontal partitioning the tables that related with the same split key (here is the federation distribution name) should be put into the same databases (federation members). For example if we move the record in Product table into federation member 1 if UserID = 3, then all records that UserID = 3 in the table ProductDetails should be moved in federation member 1 as well. In SQL Azure Federation, the group of the records that related to the same federation distribution value called Atomic Unit. 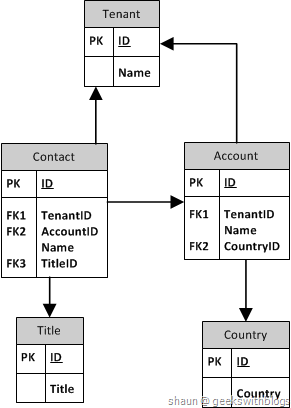 This is very important and useful when using SQL Azure Federation which I will explain in the coming few posts. In this post I covered some basic information about the data federation. I talked about the approaches that we can use to partitioning our data. I also described the different between horizontal partitioning and the the vertical partitioning, and the goal of horizontal partitioning. Finally I talked about the concept of SQL Azure Federation. In the next post I will demonstrate how to create a database and use SQL Azure Federation, to split my original database into members.